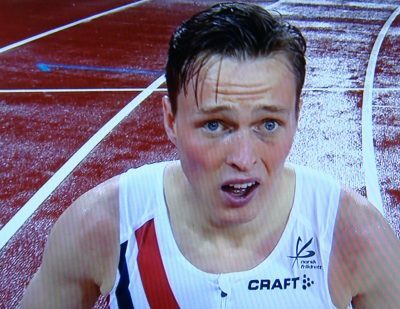 Norway’s World Champion runner Karsten Warholm is having a tough start to this year’s track and field season. He lost another race in the 400-meter hurdle for the third time in a row over the weekend, while 17-year-old Jakob Ingebrigtsen won a 1,500-meter race but had no chance to celebrate. The track and field action moved from Bislett Stadium in Oslo on Thursday to Stockholm. Warholm ran to his latest second-place finish behind the comet from Qatar, Abderrahman Samba, who won with a time of 47.41 seconds. There were no hard feelings, with Warholm crediting Samba for his own fastest time yet of 47.81, a new Norwegian record. “It wasn’t good enough to win, but you see that I’m on the right way,” Warholm told Swedish state broadcaster SVT after the race. He added that the competition from Samba this season “has taken me to a new level. I hate to lose, and he has pushed me,” Warholm told Norwegian Broadcasting (NRK). He also credited his coach, Leif Olav Alnes, for getting back on his feet after his loss on home turf before a sold-out crowd at the Bislett Games last Thursday. “Leif Olav has motivated me to step on the gas again today,” Warholm said. Both Samba and Warholm also face tough new competition from young Rai Benjamin of the US, who ran the 400-meter hurdles in just 47.02 seconds at and NCAA track meet in Eugene, Oregon Friday night. Jakob Ingebrigtsen, meanwhile, ran to victory in the 1,500-meter event even though he wasn’t as fast as he was in Oslo last week. He clocked in at 3:37.42, compared to 3:36.06 at the Bislett Games, and didn’t have time to celebrate anyway. Newspaper Aftenposten reported how the teenager had to travel straight back home to Sandnes on Norway’s West Coast to go through an oral exam at the end of his school year. “I would have gladly traveled on to St Moritz with my two brothers (Henrik and Filip Ingebrigtsen are also top athletes) but unfortunately need to get home for an exam,” Ingebrigtsen told Aftenposten. He’ll head to the alps right after the exam, however, to train at high elevation with them.